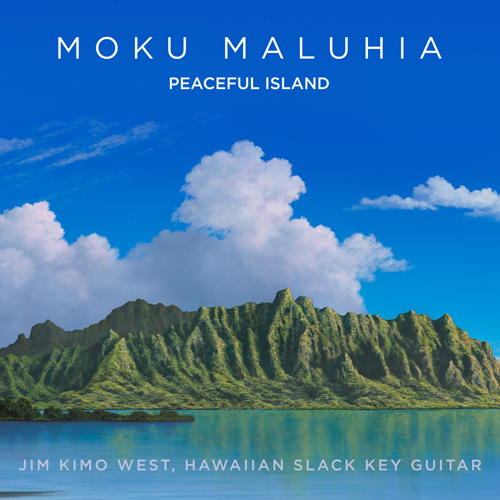 Released in February 2018, Moku Maluhia (Peaceful Island) features an all-original playlist of super-relaxing slack key guitar with guest appearances by George Abe on shakuhachi and Simone Vitucci on cello. Jim "Kimo" West joins Ken Emerson to start up the 2018 Slackers In Paradise tour in support of their CD/ vinyl release of the same name. Check out the tour dates! Discover what makes Jim "Kimo" West a unique artist and friend to so many as join him and are transported to the beautiful and magical Hawaiian islands through his music and photolouge. Here he stays closer to the slack-key tradition, playing solo with occasional support from shakuhachi flute and cello. Kimo's compositions are consistently lyrical and beautiful without being cloyingly "pretty."